ALSO ENCOUNTERED in this fleurs de sal perfumed seaside town at beach-sited, candlelit 'La Prua', an almost Burgundian, silvery-gold Chardonnay. This complemented a small glass box packed with soft rabbit sprinkled with crisp, red peppercorns with a single green feather of holly-like bay leaf. 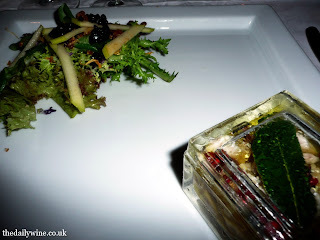 On the opposite diagonal of the square plate, a tickle of salad woven with walnuts, circles of solidified balsamic vinegar and topped with green apple shards. However this wine was not from France, but one of Italy’s smallest wine regions, Umbria, in fact being preened with Grechetto. Trendsetter Marchesi Antinori's '04 Cervaro della Sala had new-ish French oak on the nose (from small barrels), an initial fug of flavour gave way to rainbow of blissful aromas which lifted from the glass, including toasted merringue, salted butter and petals in water. On the palate, salted butter, a hint of oleander, straw (albeit the grade destined for a thoroughbred’s stable) followed by a devastatingly long aftertaste, like a lingering gaze.